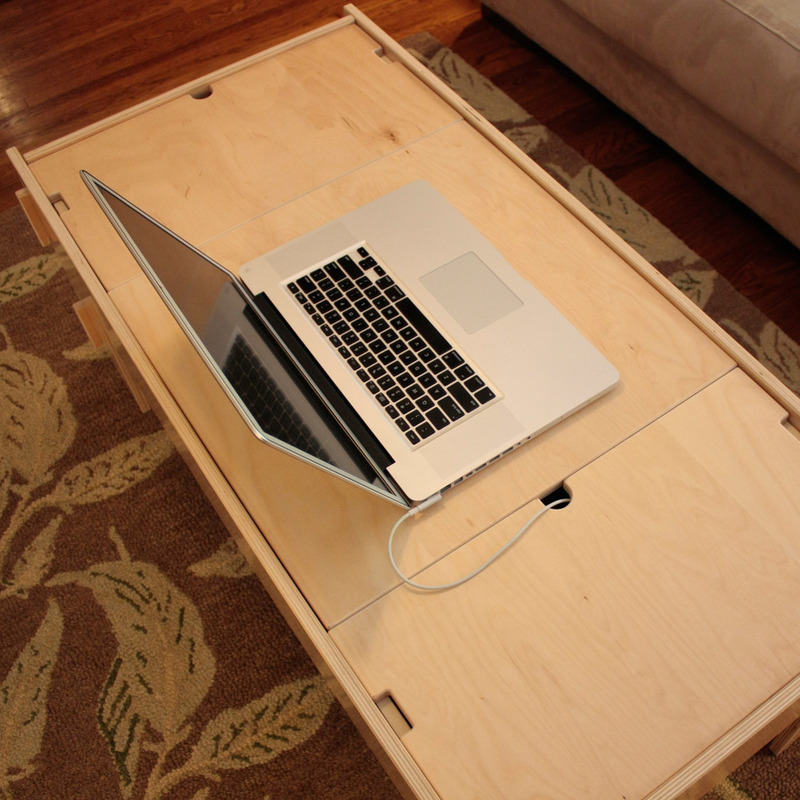 The Storage Coffee Table is perfect for conveniently stashing electronics and remotes out of sight in your living room, while giving you a great work surface for impromptu couch surfing or work. This table is available in two configurations, one with and one without an extra lower shelf. The Storage Coffee Table leaves room for your legs when you stretch out from the couch or sit on the floor, while the Storage Coffee Table with Shelf gives you a spot for additional storage underneath. 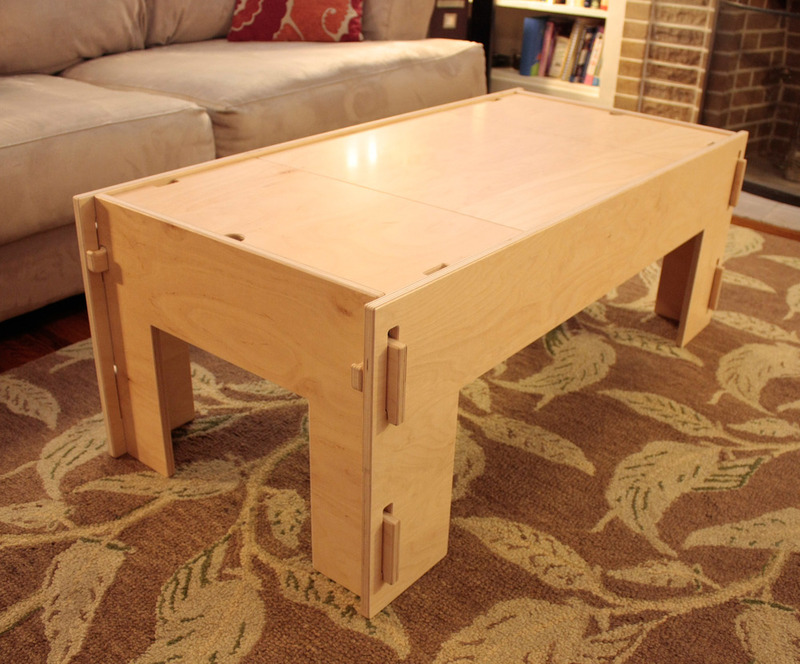 While similar to our Lego Storage Tables, the Storage Coffee Tables are unique in two ways. First, they have cutouts in the bottom corners of the storage compartment for wires and power adapter cords to pass through. Second, the small top panels are designed to allow cords to pass through without having to disconnect and feed them through a hole. The two small cover panels each have a notch on one edge to allow cables to pass through, so you can just lift up a panel to grab a plugged-in gadget, then set the panel back down around the cord without needing to disconnect anything. Or if you prefer, one or both small cover panels can lift out and store out of the way on the ends of the table on the built-in hangers. The large middle panel provides a great work surface to set up your computer or tablet for work. When one or both small panels are removed, it slides smoothly side-to-side on felt covered rails to allow access to the entire storage compartment below. The four inch deep storage compartment has cutouts in the bottom four corners to allow wires and power cords to pass through. Just plug in a power strip, stash it inside the storage compartment, and charge all your devices stored within. Like all Klevr Furniture, it assembles quickly with no tools or hardware in only a minute or two. 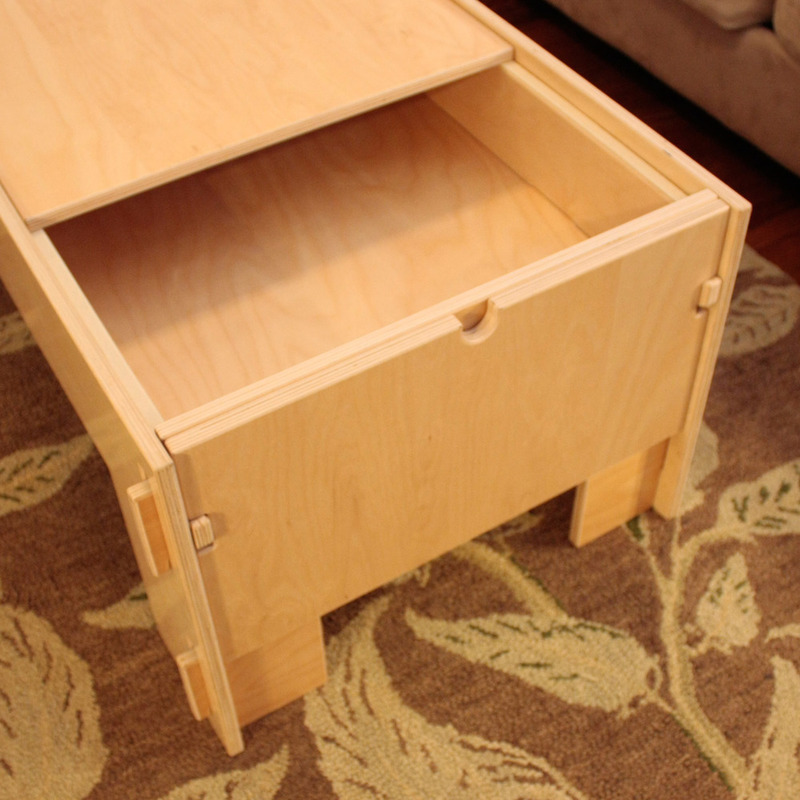 The Storage Coffee Table slots and snaps together smoothly and solidly using Klevr's unique assembly method without any friction-fit joints or hammering required. 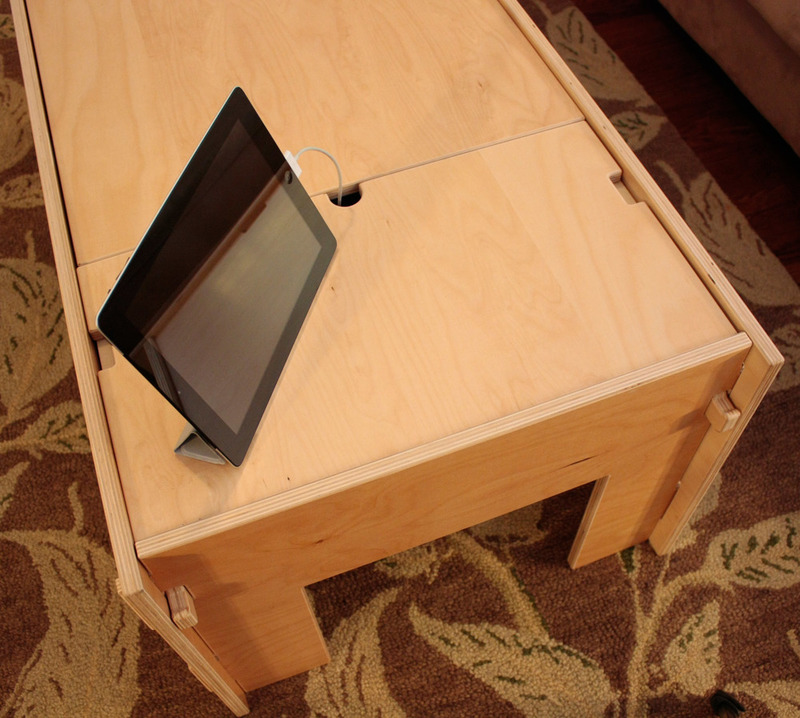 The Storage Coffee Table has cable pass-thrus in the bottom corners of the storage compartment. Note that it does not include a drop-in divider like our Lego Storage Tables. 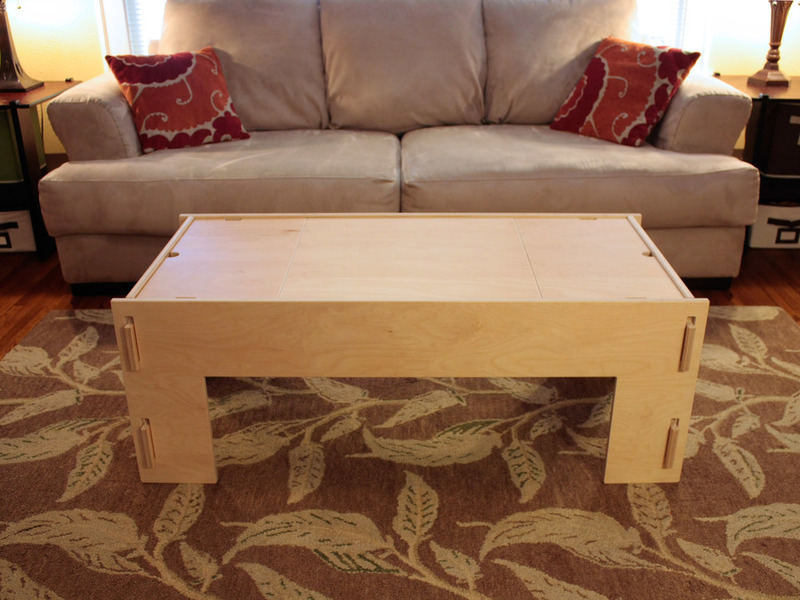 The Storage Coffee Table with Shelf has cable pass-thrus in the bottom corners of the storage compartment. Note that it does not include the drop-in divider like our Lego Storage Tables.